Have you ever been in a situation when you left your home without closing the personal websites such as your Facebook page, Twitter account, online banking portal and your personal blog? If you have, then you would know how excruciating the thought of others fiddling with your accounts can be. Guess what, you can use any Apple device to shut down all Safari tabs remotely on your Mac! iCloud can be used to sync your Apple devices to check out the tabs you have opened in other devices/systems and you can also close your Safari tabs on your fingertips. Make sure your Mac, iPhone and iPad are logged into the same iCloud account, otherwise you won’t be able see the open tabs of other devices. It is possible to close your Safari tabs on any Apple device like from your iPhone to Mac, Mac to another Mac, iPad to Mac or vice-versa. We recommend you to do it on iPhone because you always carry your smartphone wherever you go. Note: You need to follow the same process to close the Safari tabs on all your Apple devices. Step 1: Unlock your device. Step 3: Go to Safari’s tab view on iOS. Step 4: Click on the Tab Switcher which you will see at the bottom of your screen, then scroll down and click on the iCloud tab. Step 5: Now, you see all the displayed tabs, select the one which you would like to close. Swipe up to close it and hit on close. Step 6: iCloud might take a few seconds or minutes to sync the changes (depending on the size of data stored on iCloud). Must Read: Lost All Your Safari Bookmarks on Mac? Step 1: Open your Mac and go to Safari. Step 2: Go to Safari Toolbar and click on the Tab button. Step 3: You will see a list of open tabs from another Apple device appearing at the bottom of your Safari window. Step 4: Now, choose and close the tabs one by one that you want to close. 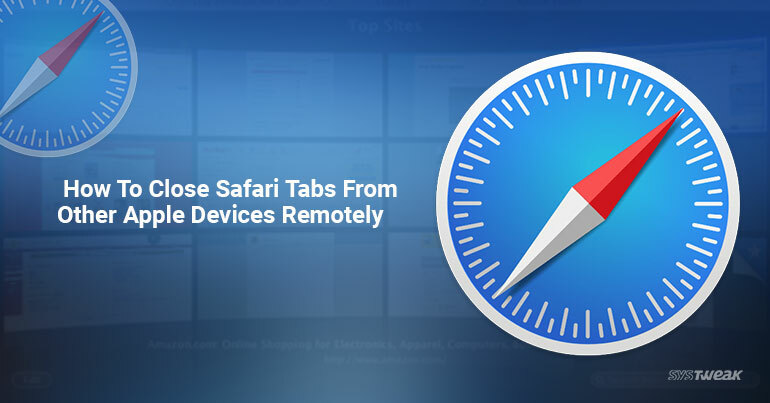 Now, you know how to close Safari tabs on Apple device remotely. So anytime you can close Safari tabs which you don’t want others to access or peep into.